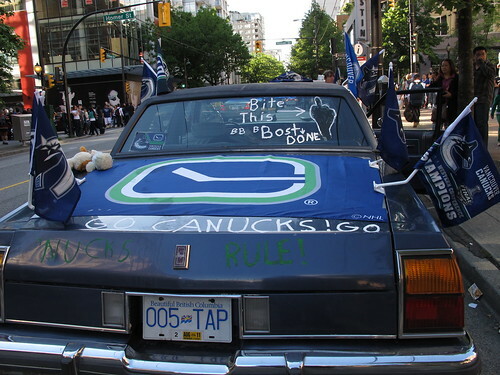 Excerpts above are from “The Canucks’ Cup run, like war, has brought us together” by Lee Bacchus and “Spectacular Vancouver conquers itself” by Tristan Markle. Also see The Stanley Cup riot shames Vancouver by Matthew Good in The Guardian, Please Stop Saying You’re the ‘Real’ Vancouver by Professor Jon Beasley-Murray in The Tyee; The myths of Vancouver’s superiority do the city a disservice by Dave Bidini in the National Post; Busting myths of Vancouver’s destructive Stanley Cup riot and The sad, painful truth about the rioters’ true identities by Gary Mason in the Globe and Mail, Dear Hooligans by Morgan Brayton, On Riots & Anarchists: the Media’s Reactionary Propaganda at Politics Respun, and Vancouver Burns after the Stanley Cup by Skot Nelson. And on the other side, I disagree with most media reports all of which seem to share in the collective denial that this hockey fan behaviour is more widespread than “a handful” and has anything to do with hockey. On the night of the Stanley Cup final, I went with two friends and a young child to the CBC fan zone. We arrived around 5:15, just minutes after the game had started. 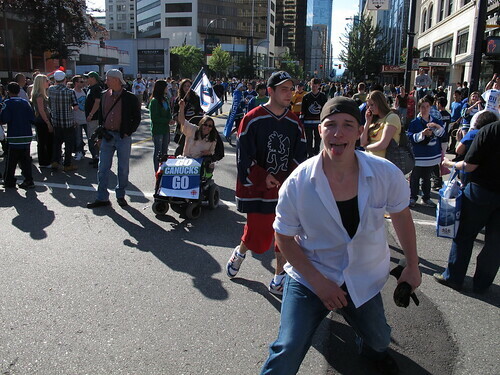 We mainly wanted to witness the phenomenon downtown. Even at the very beginning of the game the mood was tense and unpleasant, with lots of drinking and pushiness. We walked our bikes past a man covered in blood but sitting quietly next to a police officer as if this were normal. My usually unflappable friend took her child home after fifteen minutes, and I left thirty minutes later. There was no actual joy I could identify anywhere, very little real sense of fun or creativity in the crowd, and no sign of what I’d consider a happy carnival atmosphere. It felt sharp-edged and desperate. Everyone knows what happened three hours later. Aquilini, the developer who owns the Canucks, should answer for some of this. So should the rest of the NHL ownership, with its aggressive advertising and increasing tolerance—or let’s face it, encouragement—of violence in the game. I’m really surprised that anyone can honestly believe that the game’s violence doesn’t set an answering tone amongst spectators. Meanwhile, Vancouver (not to mention all of British Columbia) needs to look to itself. Whatever hockey fans may wish to believe, this riot was not the work of an isolated few people. I was there, having cycled back to the edge of downtown around 9 pm with a friend to make sure the crowd hadn’t smashed the windows of the gallery I work with, which is located half a block from the riot site at the Main Post Office. Even from a safe distance we could see thousands of young people—who were clearly fans—egging on the violence and cheering each explosion. Many hundreds if not thousands were involved in the smashing and looting, and everyone seemed fueled by a kind of fatal exhilaration. It seems obvious that no matter how the police had responded, the night would have gone badly. There was simply nowhere else for the deliberately engineered fan frenzy to go. Aggressive energy has an ecology or economy that our uniformly pro-hockey politicians simply don’t seem to understand. And to those saying Night 7 was different than Nights 5 or 6, I’d say to you that it’s simply not true. Monday and the previous Friday felt exactly the same. Each night the fans mirrored the games themselves—scrappy, restless, and aggressive. On Night 5, drunk fans from the Blarney Stone bar crashed an opening at Artspeak Gallery across the street, drunkenly manhandling artworks and intimidating the guests, and this was not an isolated event. All those wishing to say that last night’s riot signifies nothing about our city nor about hockey and its fans, but should just be written off as the work of a handful, need to get more realistic fast. The way hockey is managed is a serious problem, and so is the fact that this region produces so little else in the way of widely accessible culture, thanks to the government’s aggressive anti-cultural stance and its radical, unique-in-Canada slashing of cultural budgets. The riot just revealed in a more tangible way than usual a structural lack of cohesive community fabric. Manufactured hockey “solidarity” is not a real collective bond. It produces no solid identity nor pride in one’s own environment. There are cultural and socioeconomic problems at work here, and the hockey machine—with its ramped up fandom—is undeniably amplifying them. 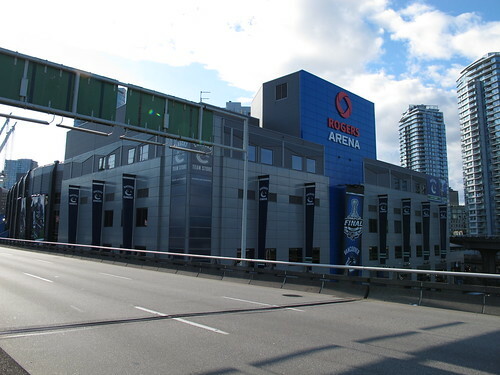 Canucks owner and slum landlord/property speculator The Aquilini Group has built perhaps the ugliest stadium in North America smack in the middle of Vancouver’s downtown. (2 stadiums side by side near a beautiful waterfront—a travesty of urban planning.) Now we hear that Aquilini is involved in the development of more cookie-cutter condo highrises. How many more concessions will we give to these people? Aquilini Sr. made his money as a slum landlord. Why are his aesthetics now to be ours? 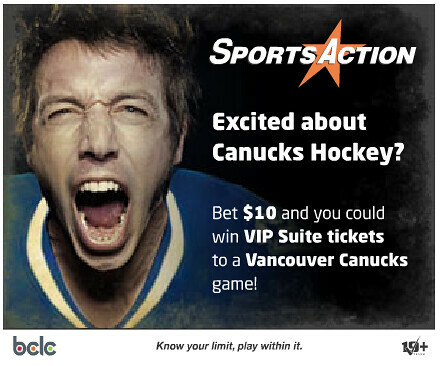 On top of which his hockey franchise has teamed up with the government’s BC Lottery Corp to market online Canucks sports betting to a young male market, which happens to be the fastest growing gambling demographic of gambling addicts in Canada, a statistic highly correlated with teen substance abuse and suicide. Look at the remarkably aggro ad at top, and take a stab at which target audience it wants to attract. Should we not aggregate all of these things and ask ourselves who we really want to build our community with, and how? We have largely failed to produce the sort of long-lived, stable cultural life that makes cities successful. The current City Council has actually been doing a decent job of trying to build stable cultural life here, but given the BC government’s unreasonable cultural cuts, the City must swim against a strong current. And add this to rampant property speculation, insanely high housing costs, bully boy developers, and a city demolishing its history and identity as fast as it can to build a condo-ridden mediocrity in the image of pure capital—it’s a hard city to love right now. The harshness of hockey exactly mirrors the harshness of the current political economy. What would I like? A hiatus from hockey. A property speculation tax and no more spot-rezonings and other concessions to developers. 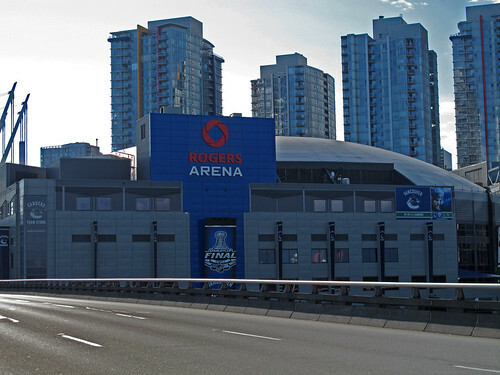 Vancouverites to spend as much on arts and culture as they do on hockey. A summer of love, except for slum landlords who own hockey teams. I got to spend several hours chatting to Gordie Howe at a party in Vancouver last August (this is the sort of thing that seems to happens mainly to hockey haters). He complained about pain in his elbows. I told him it was his own fault. He laughed good-naturedly and agreed. This entry was posted on Thursday, June 16th, 2011 at 9:57 am	and is filed under architecture, art, British Columbia, politics, urban planning, Vancouver. You can follow any responses to this entry through the RSS 2.0 feed. You can leave a response, or trackback from your own site. Great piece. The last paragraph especially had me nodding in agreement. Absolutely! Thanks for this. Also, it seems apparent to me that you are clearly not the biggest hockey fan and I’m sorry to tell you, you’re in a minority in Canada. If you feel it’s unfair that hockey overshadows things like music and the arts, you’re 100% right, however those don’t bring in the revenue that a sporting event brings. That’s the curse of living in North America. Sports will always win. (Though even in ancient times, often sporting events were the #1 attraction – The gladiatorial games…) I am a theatre artist in Calgary and I have felt the pinch of sports but cannot complain, as I’m also a hockey fan. After a while, you either have to embrace it or forget about it. Unless you can find a way to get 15 000 people to come see a play on one night, sports (and not just hockey, but all sports) are always going to take a front seat.